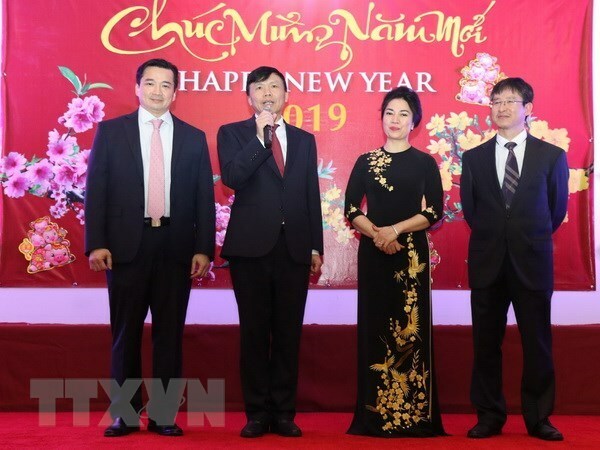 New York (VNA) – Vietnam’s Permanent Mission to the United Nations (UN) and the Vietnamese Consulate General in New York have held a get-together on the occasion of the upcoming Tet (Lunar New Year) festival, with the participation of nearly 400 overseas Vietnamese. In his remarks, Ambassador Dang Dinh Quy, head of the mission, informed participants about what the homeland has achieved in 2018. The most noteworthy is Vietnam’s ratification of the Comprehensive and Progressive Agreement for Trans-Pacific Partnership (CPTPP), it successful organisation of the World Economic Forum on ASEAN, the country’s first-ever membership of the UN Commission on International Trade Law (UNCITRAL), and the deployment of the first level-2 field hospital in South Sudan for UN peacekeeping operations. Vietnam aims to boost bilateral ties with foreign countries in 2019, while stepping up multilateral diplomacy and relations with the UN, he said, adding that, the country will work harder to win a non-permanent seat at the UN Security Council for the 2020-2010 tenure, Quy said.